Got a 'lil farmer on your hands? John Deere Ground Force takes outdoor play to the next level. The tractor has a functioning FM radio and detachable trailer. Worried about your 4-year-old's driving skills? 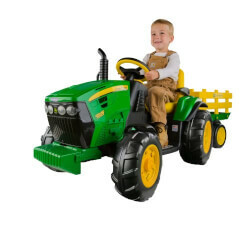 Don't worry; this John Deere 4-Wheeler tops out at 4mph.